Sermon- February 17, 2013 - Paradise lost is reviewed but not in the traditional Adam & Eve mythology but rather in the Armodox understanding. Important comments also about faith, the Church and the pagan practices of Diaruntarch. 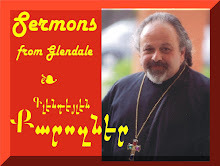 Sermon delivered and recorded LIVE at the St. Peter Armenian Church & Youth Ministries Center, Glendale, CA. The importance of a small comma in the Battle of Vartan, the battle for your dollars and the battle to win the war. Buying your time and your attention at the Superbowl. Sermon delivered by Fr. Vazken Movsesian and recorded LIVE at the St. Peter Armenian Church Youth Ministries' Center in Glendale on February 3, 2013. Language: Armenian at the beginning. English begins at minute 11 and 40 seconds.